How Much Do Spotify Ads Cost? 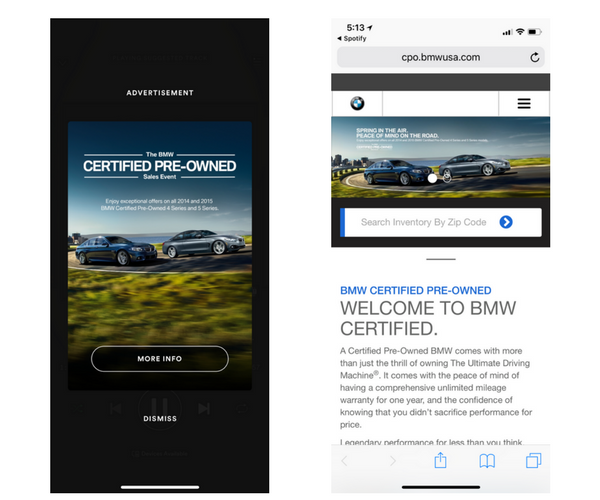 In investor meetings ahead of Spotify’s IPO, the company’s CEO, Daniel Ek, described Spotify’s mission as the “hard work of helping one million artists live off their art.” As Spotify Technology SA goes public today, we take a look at the primary vehicle of this mission: Spotify Ads. Spotify’s self-serve advertising platform has been in beta since last year. 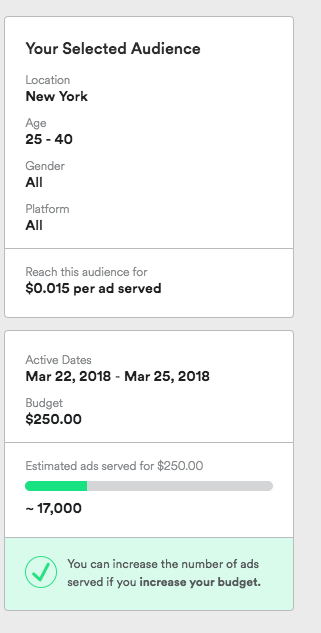 Right now, Spotify charges around $0.015-$0.025 per ad served, with a minimum of $250 in ad budget. The price depends on your targeting selection. 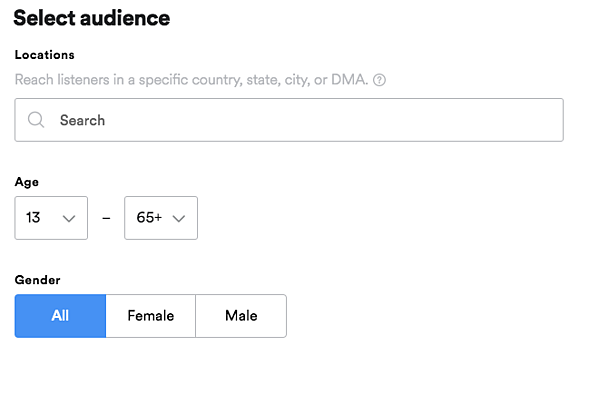 I've played around with different targeting options and saw prices as low as $0.015 per ad (San Francisco, targeting all music genres) to $0.018 per ad (London with the same targeting), to $0.023 for an ad run in Europe with more granular targeting by gender, device, and music genre. Here’s a quick guide on how to get started with Spotify ads. Spotify offers two objectives for advertisers. "Raise awareness" and "Promote" follow the same logic in their set-up, but the second objective lets you target fans of an artist you’re promoting. Step 2. Upload an audio or request a voiceover. Advertisers can create audio ads by either uploading their own audio files or submitting a script. Spotify will provide voice over services for free; advertisers only pay for ad distribution. 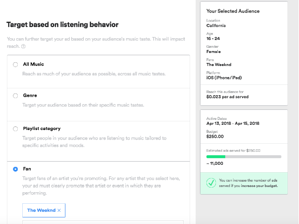 You can target Spotify ads based on demographics, listening behavior, and platform. You can reach people in specific countries, states, cities, or DMAs (designated market areas). Segmentation is also available by gender and age. 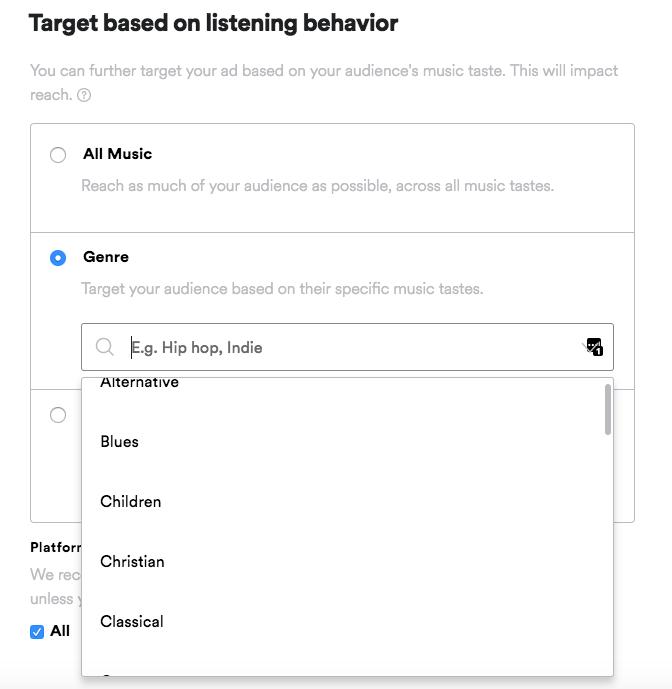 Spotify allows advertisers to reach audiences across all music tastes (“Target All Music”), by genre (e.g., Alternative, Blues, Christian, Classical, EDM, Metal, Jazz, Holiday, etc. ), or by playlist category. 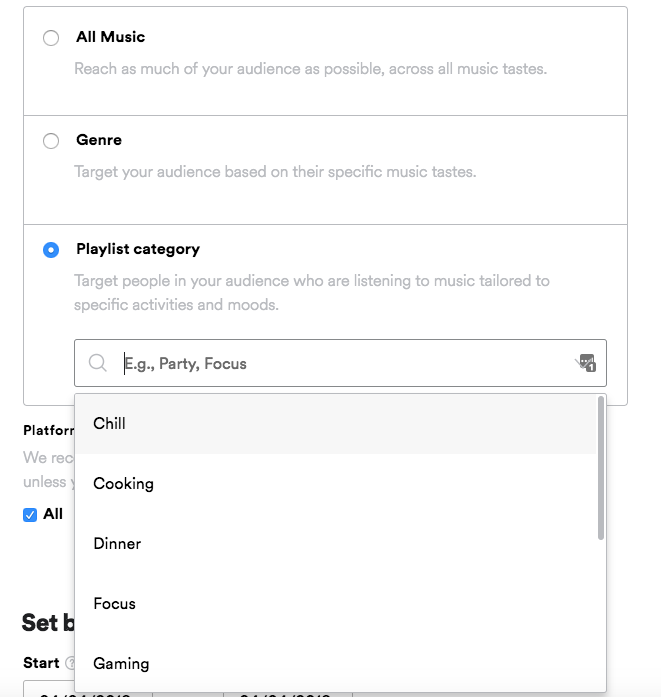 The playlist category is the closest thing to behavioral targeting, as you can select the music tailored to specific activities and moods (e.g., Cooking, Workout, Gaming, and so on). Spotify recommends choosing all platforms to maximize reach, but you can also configure platform-specific campaigns to target just the iOS/Android/Desktop users. 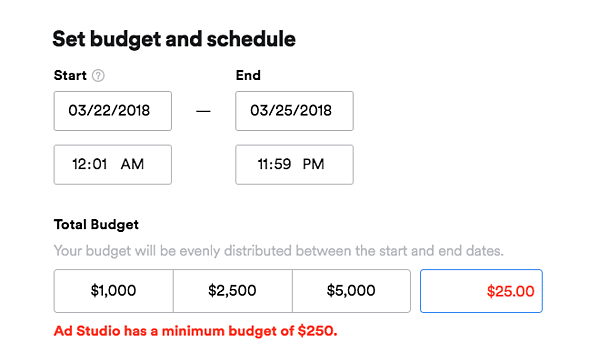 Spotify Ad Studio requires advertisers to spend a minimum of $250 in ad budgeting, charging them $0.015-$0.025 per each ad served. The price depends on the country and targeting: the more granular your targeting, the more expensive the ad. Your budget will be automatically distributed between the start and end dates of your campaign. Be aware that the start date is set at least two days from the current date due to the approval process. Your account will be charged after the end date of your ad campaign. After you’ve selected your audiences and set your budget, you can add a companion image, a headline, and a link to the landing page that your audience will visit when they click on the image displayed during your audio ad. That’s it! As you can see, Spotify ads are easy to set up. Things get a little tricky when you begin to think of ways to make ads relevant. How much can you guess about a person based on their favorite music? To increase ad relevance and make those ad cents count even with broad targeting, consider the following tips and best practices. Spotify ads run between songs, so it’s best to consider the type of music you’re targeting. Spotify recommends using background music that is similar to your audience’s preferences. If you target by city, you can also personalize your ad to the locals. For example, you can say, “Hey New York!” if you’re targeting New York. According to Spotify, their ads with direct calls-to-action have click-through rates that are ~3x higher than those with none. To increase engagement, ask the listener to do something, such as to tap on the banner to find a location. Any ad is obviously an interruption for users. As a general rule, avoid shrill or jarring sounds in your ads and keep your volume balanced throughout the ad. Below are the specs to keep in mind when creating your first ad. 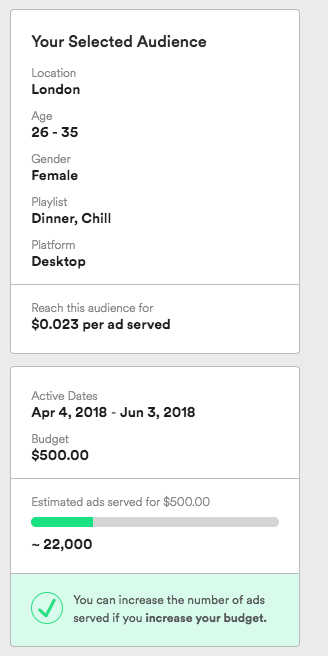 It’s super easy to set up your first campaign and get started with Spotify Ads. 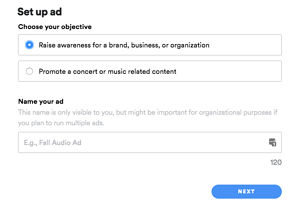 Although the targeting options are limited, at $0.015-$0.025 per ad served, Spotify is an affordable advertising options for businesses of all sizes to drive brand awareness. 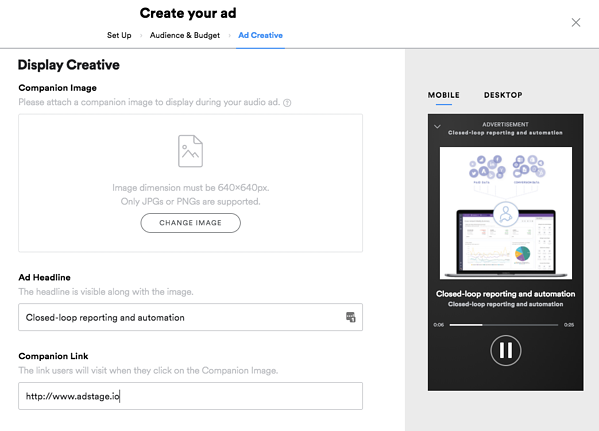 You can learn more about Spotify Ads on the Spotify Ad Studio website.